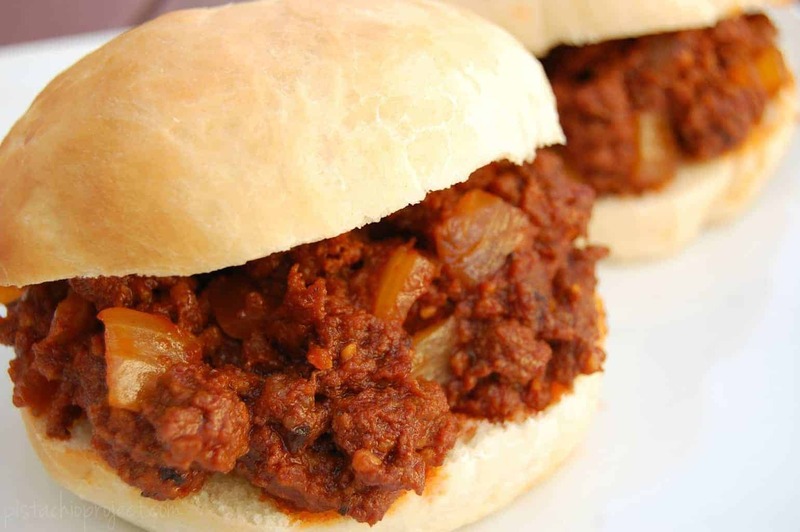 Sloppy Joes is one of those meals that I never think I’m all that interested in. I don’t know why but it just never sounds like something I’d really want. Of course, that all changes if Sloppy Joes are sitting right in front of me! I take a bite and wonder why in the world I don’t make them more often! Growing up, I’ve always associated Soppy Joes as being a canned product. Thankfully the whole meal doesn’t come in a can but the main sauce part… the part that makes it Sloppy Joes and not just a crumbly hamburger does come in a can. I was fine with that until a few years ago when I realized that cans are lined with BPA. On top of the hormone effecting BPA, there’s also the fact that whatever is in the can, is not really natural. It’s often full of high fructose corn syrup, sugar, and the like. The other day, I did it! I made homemade Sloppy Joes. It seemed obvious once I started. It’s a pretty simple recipe when you think about it. Meat and a yummy sauce and you put it all on a bun. Easy. Of course, I wanted it to be healthy so we used grassed beef, organic tomato paste, and honey. There’s no more worry about what is in my Sloppy Joes because I know just exactly what is in them! Heat large skillet over medium, add oil, garlic, onions, and peppers. Saute until garlic is golden. Add in ground beef and cook until browned. Add remaining ingredients to pan and mix well. Cook for 10 minutes and then serve on your favorite rolls or buns. This looks yummy! Definitely something kids will love! I made homemade sloppy joes for the first time just last night! I used a Rachael Ray recipe that came out quite tangy — like Carolina bbq tangy. It was very good, but “different” from what I was used to (the can). I think I now know why: her’s had the extra swing of worcestershire sauce with less sweetener. Thanks for posting this. I might just have to add some honey next time to see which way we like it best. 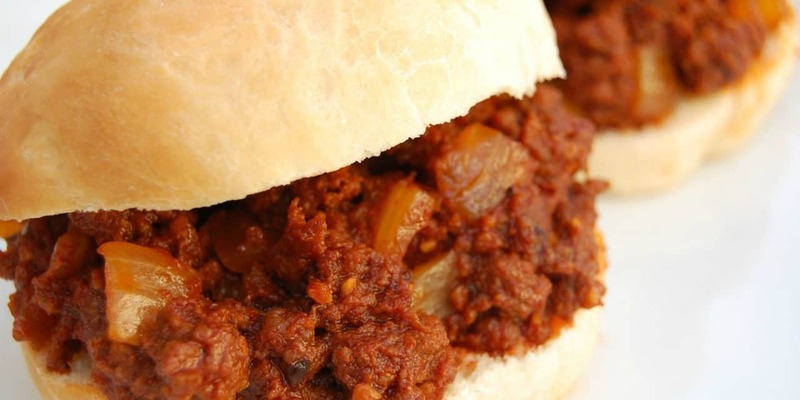 Sloppy Joes are always such a winner with kids and adults. I love your healthy alternative to the store bought version of the powder packages or the canned version. Filled with chemicals and additives that are toxic. Thanks for sharing on Real Food Fridays. Pinned & tweeted! 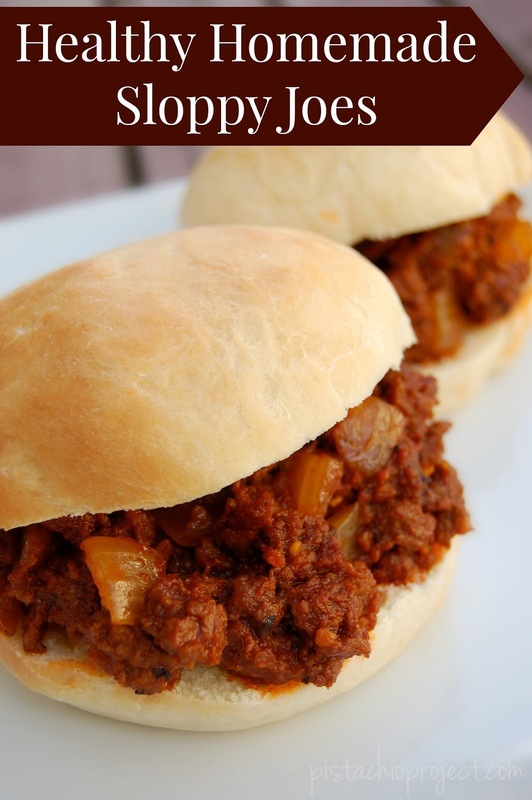 We love Thanks for sharing at Merry Monday!sloppy Joes, and this looks great! How delicious! What a great recipe for a family get together!